President Moon Jae-in’s promises to cut collusive ties between conglomerates and politicians, overhaul corporate governance and ensure fair competition have raised expectations for corporate reform in South Korea. The changes, however, shouldn’t stop at ownership and market practices, a global labor union activist said. 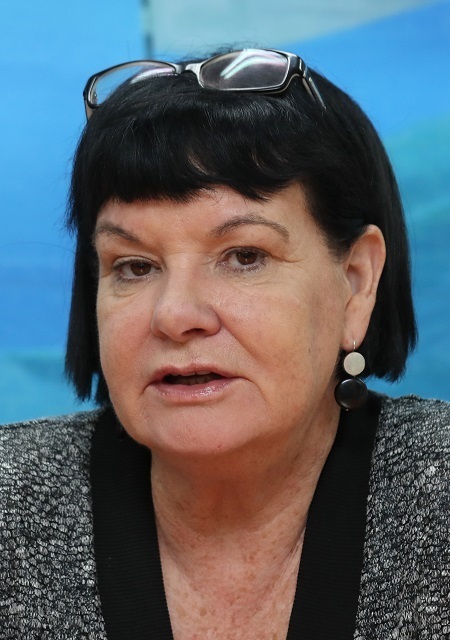 South Korean businesses have labor problems that go beyond local borders, according to Sharan Burrow, general secretary of the International Trade Union Confederation, the world’s largest umbrella labor union. “From the seafood to clothing and electronics industries, we see the breakdown of the fundamental labor rights and decent work in global supply chains because of the corporate greed,” she told The Korea Herald in central Seoul last week. South Korean companies are no exception to the exploitive practice, she said, citing the world’s largest mobile phone maker Samsung Electronics. “When I visited a range of Samsung contractors and factories, I witnessed their anti-union actions,” she said. In October last year, the ITUC, along with IndustriALL Global Union, has released a 32-page report on Samsung, exposing workers’ conditions at Samsung’s subcontracted factories around the world, including South Korea. According to the report, titled “Modern Tech Medieval Conductions,” Samsung’s supplier factories terminated contracts with work sites with union membership in Indonesia, employed underage workers in China and were accused by the labor authorities for dangerous and precarious working conditions in Brazil. In its home turf, the group faces 79 industrial death claims by workers at computer chip and LCD factories, according to local worker safety group Banolim. More recently, four workers at its mobile phone parts suppliers suffered loss of vision and brain damage allegedly due to work-related methanol poisoning. Burrow, who met Moon during her two-day visit here, emphasized the government’s role in safeguarding basic labor rights and rewriting rules to make capitalism more inclusive and fair for everyone, she said. “Government should put the mandate in place that labor rights, safer working conditions and minimum living wages should be guaranteed in big business supply chains at home and abroad,” she said. “If workers earn fair wages and if they have decent work, they will consume more. So corporations can also have a more sustainable future,” she added. Established in 2006, is the ITUC represents 181 million workers under 340 local labor unions from 163 countries. South Korea’s two biggest umbrella labor unions -- Korean Confederation of Trade Unions and Federation of Korean Trade Unions -- are also members.